The diverse responses of Australian businesses to climate change and the legal responsibilities of their boards to respond appropriately to climate change are highlighted and lead into a discussion about whether capitalism, as an economic system, has the capacity to deliver a carbon free society. More parochially, the Great Barrier Reef is not doing well after the bleaching events of 2016 and 2017 but better methods of eliminating feral cats and the discovery of several colonies of Night Parrots provide some good news. Twenty-two of Australia’s largest companies have business strategies that are based on global climate action failing to halt carbon emissions rather than organising their activities to reduce emissions (and remember the on-going fossil fuel funding activities of big banks highlighted last week). Moving tentatively in the other direction, insurer QBE has announced its intention to withdraw from insuring new mines, power plants and transport networks associated with thermal coal (but will still insure metallurgical coal, oil and gas). QBE’s directors might wish to consider further restrictions on insuring fossil fuel activities if they read a follow up to an earlier (2016) legal opinion that found that company directors who do not properly manage climate risk could be held legally liable for breaching their duty of care. Hutley and Davis’s recent report identified five developments over the last two years that have raised the bar on what courts are likely to require of boards of directors in responding to climate change. Capitalism may or may not be able to eliminate greenhouse gas emissions, which is what is necessary, and quickly, but sensible market-based strategies can reduce emissions as the graph in this article clearly demonstrates. Research demonstrating that the coral bleaching events of 2016 and 2017 on the Great Barrier Reef had devastating effects on the annual coral spawning, and hence the growth of new corals and recovery of the reef, has been widely reported in Australia. But even the New York Times (New Yorkers are famous for regarding anything west of the Hudson River as irrelevant) felt it was worth highlighting the damage done not only to the reef itself but also to local jobs and economy. In somewhat better news for Australia’s wildlife, in the Fitz-Stirling region of south-west Western Australia Bush Heritage and partners are using sun-baked, smelly, sweating sausages to control feral cats, which are notoriously difficult to tempt to take poisoned bait. This is enabling simultaneous control of cats and foxes in the area and allowing native animals and birds, that have a natural immunity to the sausage-poison, to recover. And Birdlife Australia has provided an update on the status of the long-sought and feared-extinct but now rediscovered Night Parrot. Having been ‘lost’ for a century the Night Parrot was found in Queensland in 2013 and then in Western Australia in 2017; there is even the possibility of surviving members of the species in Victoria. Although there are now several confirmed populations of Night Parrots in Australia, it is clear that the total population is still very small and that the parrots are highly dependent on suitable habitat. Should you be in any doubt that greenhouse gas emissions are strongly related economic development and growth have a look at the graphic below showing the total emissions for the top ten emitting countries from 1850 to 2016. More interestingly, have a look at the changing rankings of the countries year by year over that period. Note how the USA has been number 1 throughout, with the UK at 2 until the mid ‘70s when for a brief period the UK, Germany and Russia were neck and neck, before Russia became the clear number 2. 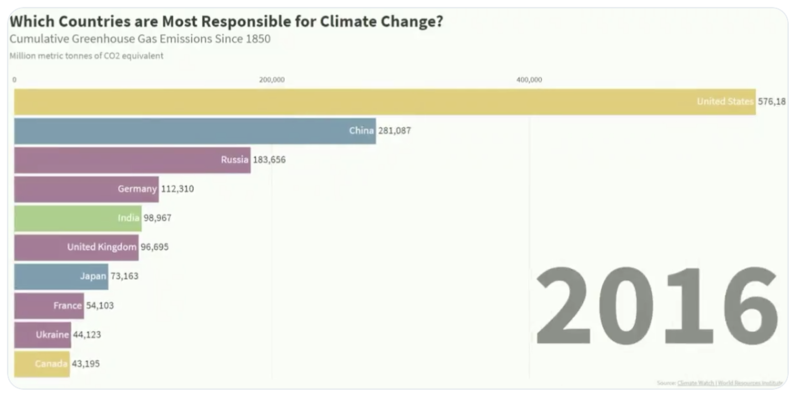 But the rapid rise in China’s emissions from the 1970s saw them overtake Russia in 2004 and by 2016 China’s total emissions were half of the USA’s total emissions. The graphic shows rankings; all countries’ actual admissions have been increasing throughout this period of course.